Of the 1.3 million victims of domestic violence every year, 85 percent of those who enter shelters say their abusive partner threatened to injure or kill the family pet. Domestic violence affects people of every race, gender, economic status, educational background, sexual orientation, religion, and nationality. That’s why, back in October 1981, the National Coalition Against Domestic Violence created the National Day of Unity, a time to remember those who have suffered at the hands of an abusive partner, to celebrate victims who survived, and a day to spread awareness about the ways in which domestic violence hurts families and impacts communities. The National Day of Unity has since grown into a month-long event, National Domestic Violence Awareness Month, held annually in October. This month, as you mourn those who have been lost to violent partners and work with your local domestic violence shelters to come up with workable solutions that save more men, women, and children, DogTime.com urges you not to forget the four-legged victims of domestic violence — the canine and feline family members who can get lost in the shuffle, left behind, and can even lose their lives at the hands of an abuser. 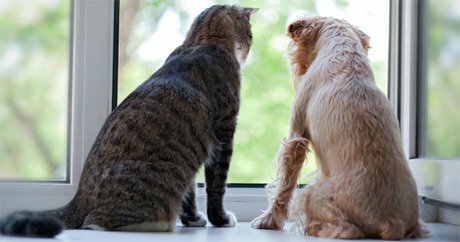 According to Sheltering Animals & Families Together (SAF-T), the first global initiative dedicated to helping domestic violence shelters develop a plan to house families and pets together, there are 1.3 million victims of domestic violence every year. A whopping 85 percent of those victims who enter domestic violence shelters say their abusive partner had threatened or followed through with their threat to injure or kill the family pet. And despite the pain, the suffering, and the risk to their own lives, 48 percent of domestic violence victims will delay or cancel their escape altogether out of fear of leaving their pets behind. Some states are beginning to recognize the importance of protecting pets in cases of domestic violence. Almost one year ago, for example, Massachusetts passed a law that insures pets will be protected from an abuser under the same orders of protection as their owners. For those who do finally flee an abusive relationship, there are a very limited number of shelters for these victims to turn to where they can bring their pets, too. But the number is growing quickly thanks to organizations like SAF-T and the American Humane Association, among others. At the Harbor House of Central Florida, for example, victims of domestic violence not only have a safe place to stay after fleeing from an abusive partner, they don’t have to worry about leaving their beloved pets behind. The organization’s Paws for Peace Kennel, first established in Fall 2012, accepts human and animal victims of abusive relationships. The High Desert Domestic Violence Program in Victorville, California, was the first domestic violence shelter in the state to adopt a pets of domestic violence program called PAWS, or Pets And Women’s Shelter. “We do not believe a family should have to compromise their safety because of the love for their pets,” the organization’s website reads. These pet-friendly domestic violence shelters like the Mt. Graham Safe House provide a safe haven for the animals, too, Aston explains. “I have heard from them also that they see a difference in their pet being here in comparison to the way they were at home with the abuser,” Aston adds in her testimonial on the SAF-T website. While most shelters for pets and people are equipped to take in small pets like dogs and cats, others, like the Littlegrass Ranch in the appropriately-named town of Comfort, Texas, allows women who have been abused to escape from their abusive partners with their lives — and their livestock. This nonprofit sanctuary has accepted domestic violence victims and their horses and other “4H animals,” as the Littlegrass site describes. For a complete list of organizations and shelters that may be able to help a victim of domestic violence flee with his or her pets, check out the SAF-T website.